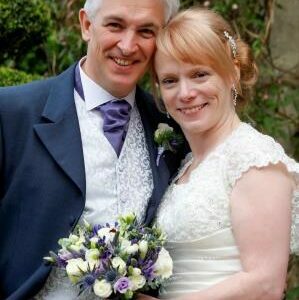 Tim and Kathryn celebrated their marriage at the Five Arrows Hotel, one of my favourite local venues. Situated in the heart of Waddesdon most bride and groom’s choose to sneak off to the gorgeous home of the Rothschild’s – Waddesdon Manor for a dramatic background for their couples photographs. 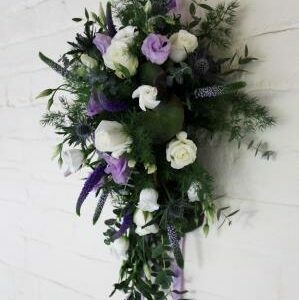 They chose a soft palette of lilacs and blues for their Spring wedding, so I chose flowers including; roses, lisianthus, veronica and eryngium thistles to create something beautiful for them. 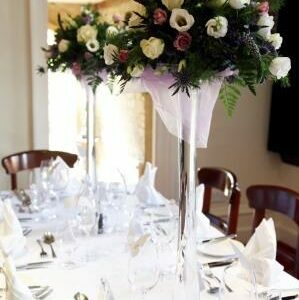 The table centres were tall and elegant arranagements which the bride and groom were able to send their guests home with at the end of the celebrations. These images were captured beautifully by All People Photography of Waddesdon.